With the new academic term on the horizon, expectations are high, anticipation evident, and fears of uncertainty uncharacteristically real. 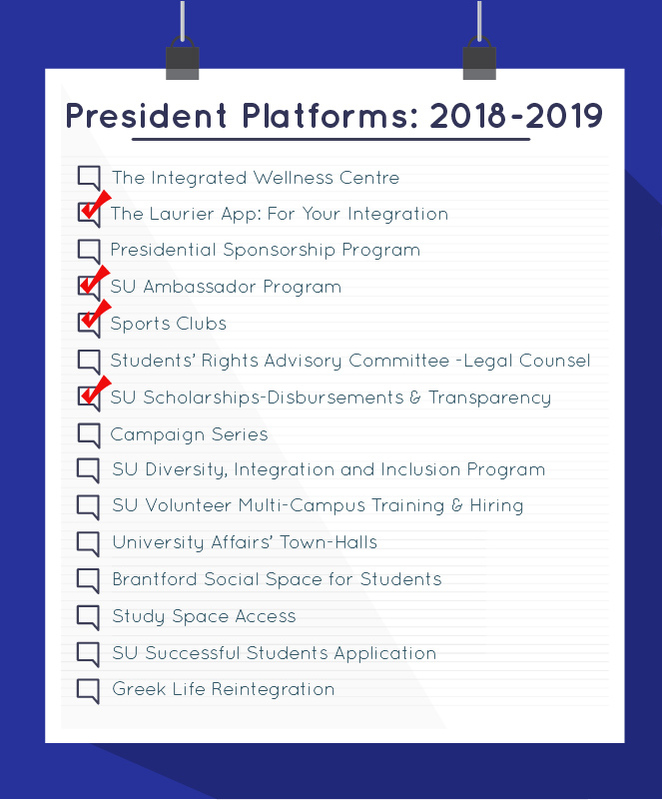 The Students’ Union advocates on behalf of the undergraduate student population and is here to support and provide you with the best possible experience. The month of July featured a focus on the financial needs of Laurier students. Vice-President of Finance & Administration Darshil Shah struck a partnership with Laurier Development and Alumni Relations to create the Wilfrid Laurier Students’ Union Engagement Bursary. This financial award will be available to student volunteers in good academic standing. We understand the economic burden that accompanies a university degree and will continue to prioritize initiatives that support an affordable, accessible, and high quality academic experience. This project marks the accomplishment of the scholarship and bursary platform commitment made to the student body. The rest of your student executives remain occupied with department plans and priorities. The Clubs & Association team has been planning the Get Involved Fair, allocating club budgets, training department executives, and also held preliminary discussions about supports with the Greek Life society. The University Affairs department is developing its federal advocacy issues and reviewing the supports provided to students with landlord and tenant issues. In addition, Vice-President Kelly will be meeting with the Honorable Bardish Chagger alongside representatives from the Canadian Alliance of Student Associations to discuss youth entrepreneurship. The Programming & Service department hosted a successful Orientation Week conference that included valuable volunteer training and team building. Excitement grows, as the Orientation Week schedules are set!